Penn State cornerback Amani Oruwariye (21) makes an interception in the first half. On a night that included constant rain, chilly temperatures and a persistent wind, the Pitt football team put up a performance to match with the miserable weather Saturday. The Panthers’ rushing attack kept them within one score during the opening half, but an unsightly 14 penalties and repeated special teams mistakes allowed the Penn State Nittany Lions to run away with the game in an embarrassing second half. The final score, 51-6, marked the largest differential in the rivalry since Penn State beat Pitt 65-9 in 1968. Redshirt sophomore defensive lineman Keyshon Camp (10) watches the last few minutes of Pitt’s 51-6 loss to Penn State. Pitt’s offense began the game by doing something it did just twice last week against Albany — they punted, after gaining six yards on three plays. Penn State quickly flashed its offensive prowess, with senior quarterback Trace McSorley finding junior tight end Jonathan Holland for a 22-yard gain on the Nittany Lions’ second play. Just two plays later, first-year wideout KJ Hamler took a handoff 32 yards down the left sideline for the first touchdown of the game, putting Penn State up 7-0. Redshirt senior defensive back Dennis Briggs (20) fails to stop to a touchdown pass Penn State sophomore wide receiver Mac Hippenhammer (12). Now facing a touchdown deficit, the Panthers returned to their week-one form on drive number two. First-year receiver Shocky Jacques-Louis provided the Pitt offense with stellar field position on the first play by rushing 38 yards to the opposing 37-yard line. From there, the Panthers steadily drove downfield until senior running back Qadree Ollison punched it in from 13 yards out. But for the second straight week, sophomore kicker Alex Kessman and the field-goal unit struggled on the extra point. A muffed snap broke up the point after, allowing Penn State to maintain a 7-6 lead. The Panthers would get the ball back on their own 27-yard line, and proceeded to show off the same rushing power that racked up 238 yards in the first week. 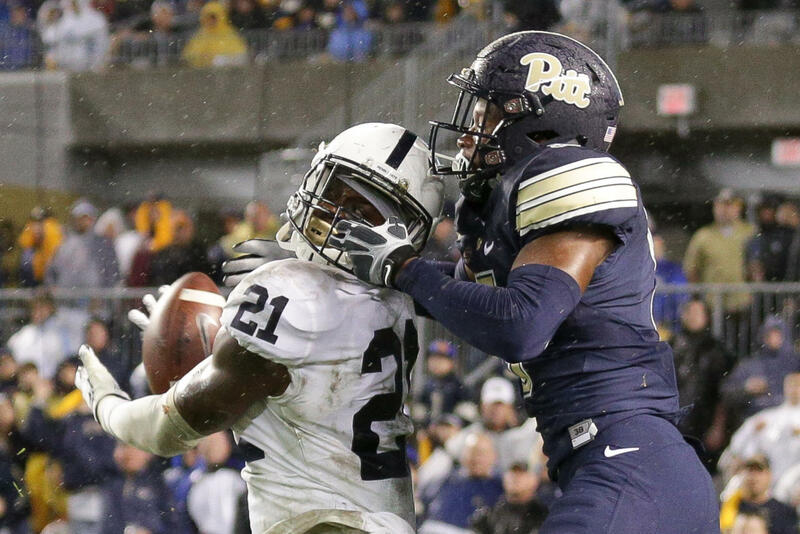 Pitt drove 42 yards — all on the ground — on nine plays down to the Penn State 31-yard line. Instead of sticking to the rushing attack, Pickett took a risk and bombed a deep pass attempt to junior receiver Tre Tipton. Senior running back Darrin Hall (22) pulls himself past the 10 yard line before being tackled. Nittany Lions senior cornerback Amani Oruwariye made Pickett pay the price, picking off the pass at the one-yard line. Later in the half, Pitt redshirt senior linebacker Quintin Wirginis leveled first-year running back Ricky Slade with a forceful hit, causing a fumble which redshirt sophomore defensive end Rashad Weaver recovered. Ollison rattled off four straight carries to the PSU eight-yard line, but the offense eventually faced a fourth-and-3 situation from the four-yard line. Typical strategy would favor kicking the easy field goal, but redshirt freshman holder Jake Scarton suffered a previous injury that left the Panthers’ field goal unit scrambling. Narduzzi elected to go for the touchdown with the Panthers’ bread-and-butter play call — a rush to Ollison. This time the Nittany Lion defense was ready, and stuffed Ollison in the backfield. What could have potentially been a 9-7 lead remained a 7-6 deficit for the Panthers. With one minute remaining in the half, the special teams unit committed another crucial error when redshirt freshman punter Kirk Christodoulou fumbled the snap and got sacked, allowing the Penn State offense to take over with elite field position. Redshirt senior wide receiver Rafael Araujo-Lopes (82) fumbles the ball after receiving a Penn State punt. The Nittany Lions made quick work of the Panther defense, as junior running back Miles Sanders ran for 21 yards and McSorley hit Hamler wide open in the middle of the end zone for a 14-yard touchdown on the very next play, giving Penn State a 14-6 lead heading into the half. In the second half, McSorley and the Penn State offense carried out a modest drive to the Pitt 27-yard line before facing a third-and-10 attempt, which the Pitt defense appeared to stifle. However, the Panthers’ Achilles’ heel of the night — penalties — was struck once more, as redshirt sophomore defensive lineman Patrick Jones II was flagged for roughing the passer, giving the Nittany Lions a fresh set of downs on the Pitt 11-yard line. Sanders picked up seven yards, and McSorley finished the job by rushing for a four-yard touchdown to increase Penn State’s lead, 21-6. On Pitt’s next drive, the Panther offense appeared to forget which way they were supposed to go. First, an illegal blocking penalty on senior defensive back Colin Jonov negated the kick return and gave Pitt the ball on their own eight-yard line. Then a false start on sophomore tight end Tyler Sear backed the ball up to Pitt’s own four-yard line. Ollison rushed for negative three yards on first down, putting the Panthers on their own one-yard line. Finally, a holding penalty in the end zone on senior lineman Stefano Millin gave Penn State a two-point safety, a 23-6 lead and total control over momentum. The next score came when PSU senior punt returner DeAndre Thompkins took a punt all the way back for a 39-yard touchdown, giving the Nittany Lions a 30-6 lead with 28 seconds left in the quarter and essentially putting an end to any hopes of a Pitt victory. In that decisive third quarter, the Panthers accumulated negative two total yards and committed seven penalties for 41 yards. The Nittany Lions added three more fourth-quarter touchdowns for good measure — an 11-yard pass to first-year Mac Hippenhammer, a four-yard rush by senior running back Mark Allen and a 34-yard pass to junior Brandon Polk — to secure the 51-6 blowout victory. For the game, the Panthers earned 300 total offensive yards — just 90 fewer than their opponent. Pickett had the first subpar start of his young career, completing nine of 18 passes for 55 yards and an interception. Pitt’s 14 team penalties negated a total of 116 yards. Ollison was the team’s lone bright spot, finishing with 21 carries for 119 yards and a touchdown. Pitt will look to move on next Saturday in its first ACC game versus Georgia Tech. Kickoff is set for 12:30 p.m. at Heinz Field.